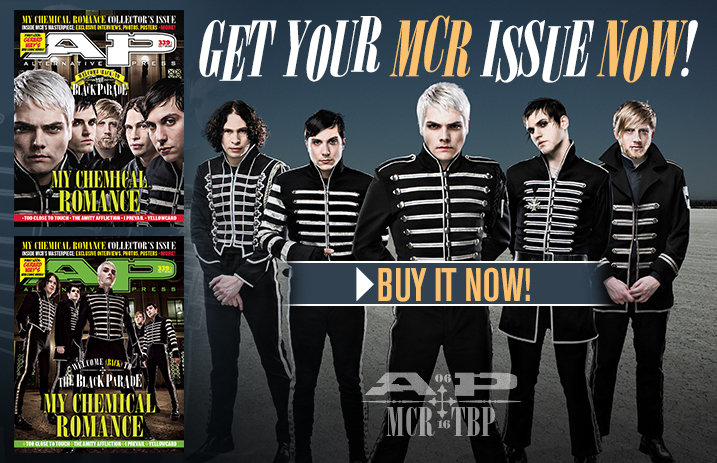 The Black Parade turns 10 and we’re ready to celebrate! We went deep in the AP archives to bring you never-before-seen My Chemical Romance interviews and photos as well as an exclusive sit-down with drummer Bob Bryar. We also spoke to the people behind the record: their “unofficial sixth member,” producer Rob Cavallo and illustrator James Jean, who brought Gerard Way’s imagery to life. We also have a FIRST LOOK at Gerard Way’s new comic series, a COMPLETE poster collection of MCR over the years and testimonials from our scene’s biggest MCR supporters such as the Word Alive, Crown The Empire and New Years Day. When we weren’t going MCRazy, we spoke to Too Close To Touch about their journey on Warped Tour and dealing with grief, as well as the Amity Affliction’s Joel Birch about his struggle with alcoholism. Yellowcard told us about their plans, post-breakup while we shine a light on I Prevail, Bad Omens and more bands to discover. Come one, come all to this magic affair, indeed!